We do not deduct TDS? We deduct do not deposit the deducted amounts? We deducted and deposited the TDS amount but we do not file Return? We Filed TDS return but as per convenience not as per the due date prescribed? We Filed TDS return as per the due date prescribed but not Issued TDS/TCS certificates to deductees? These are the common queries we encounter on daily basis in relation to TDS compliances, here in this Article I have tried to answer all the above questions and the Consequences in cases where question raised after the event of Non compliance occurred. 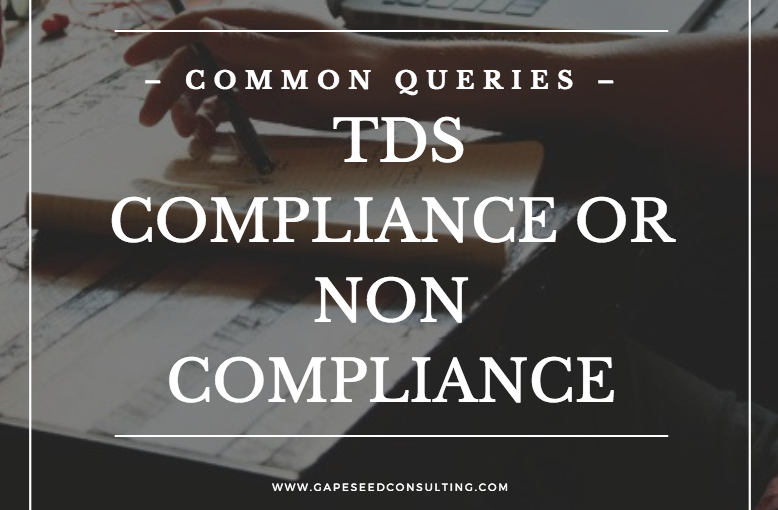 From the above Queries we have prepared a list of non compliances in relation to TDS and TCS which need to be taken care of in every organization where TDS or TCS is applicable. Non Issuance of TCS Certificates by Due date as prescribed. Under Section 201(1A) for late deposit of TDS after deduction, Deductor has to pay interest. Interest is @ 1.5% per month from the date at which TDS was deducted to the actual date of deposit. Note that Interest is to be calculated on a monthly basis and not based on the number of days i.e. part of a month is considered as a full month. For example, say TDS payable amount is Rs5000 and the date of deduction is 10th January. Say you pay TDS on 20th May. Then the interest you owe is Rs 5000 x 1.5% p.m. x 5 months = Rs 375. “Month” has not been defined in the Income Tax Act, 1961. However, in number of cases at High Court, it has been mentioned that it should be considered as a period of 30 days and not as an English calendar month. TDS amount is to be paid from the date at which TDS was deducted, not from the date from which TDS was due. For example, let the due date of TDS payment be 7th June and you have deducted TDS on 20th May. Say you have not deposited TDS by 7th June. Then you will be required to pay interest starting from 19th May and not 7th June. Also consider the case in which you deposit tax one month after the due date. Say you have deducted TDS on 1st July. Then the due date is 7th August. Now say you deposit tax on 8th August (i.e. one day after the due date). Then interest is applicable from 1st July to 8th August i.e. for a period of 2 months. You now have to pay interest of 1.5% p.m. x 2 months = 3%. Under Section 234E, Dedcutor will have to pay a fine of Rs 200 per day (two hundred) until the Date of filing of return. Dedcutor has to pay this for every day of delay until the fine amount is equal to the amount you are supposed to pay as TDS. For example, say that TDS payable amount is Rs 5000 on 13th June and it is paid on 17th December (i.e. 189 days, counting 17th December). Then the calculation comes out to Rs 200 x 189 days = Rs 37800, but since this is greater than Rs 5000, Dedcutor will have to pay only Rs 5000 as the late filing fee. Added to this, Dedcutor also have to pay interest which is covered in the section 201(1A) mentioned above. Equals to the amount that was failed to be deducted/collected or remitted may be imposed. The Tax deducted at source by him as required by or under the provisions of Chapter XVII-B, he shall be punishable with rigorous imprisonment for a term which shall not be less than three months but which may extend to seven years and with a fine. Penalty (Sec 234E): Deductor will be liable to pay way of fee Rs.200 per day till the failure to pay TDS continues. However penalty should not exceed the amount of TDS for which statement was required to be filed. Penalty (Sec 271H): Assessing officer may direct a person who fails to file the statement of TDS within due date to pay penalty minimum of Rs.10,000 which may extended to Rs.1,00,000. Penalty under this section is in addition to the penalty u/s 234E. This section will also cover the cases of incorrect filing of TDS return. The TDS/TCS return is filed before the expiry of a period of one year from the due date specified in this behalf. 272A(2)(g) :shall pay, by way of penalty, a sum of one hundred rupees for every day during which the failure continues Penalty shall not exceed the amount of tax deductible or collectible, as the case may be. 272B. Penalty for quoting wrong or invalid PAN, penalty of Rs. 10000/- may be imposed as required under section 139A (5A). Disclaimer: The views and opinions expressed in this article are those of the authors and do not necessarily reflect the official policy or position of any agency of the Indian government. Examples of analysis performed within this article are only examples. Assumptions made within the analysis are not reflective of the position of any government entity of India. 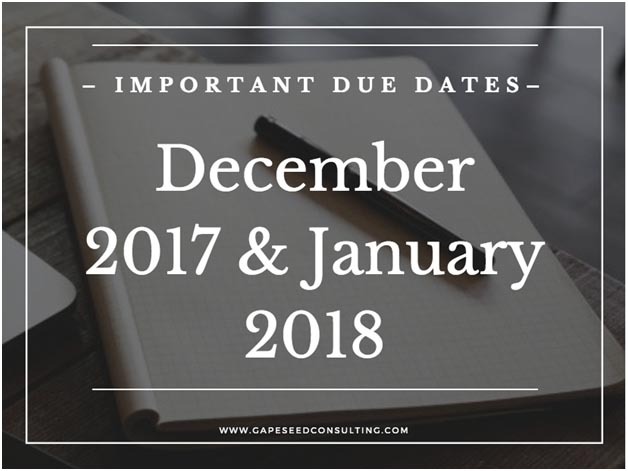 The following are some of the important due dates for the coming 2 months related to payments and filing! If you seek any further clarity, feel free to write to us on, info@gapeseedconsulting.com or you can also call us at +91-9599444639. As we all are aware about the fact that GST has already been introduced by the Central Government/State Government. The GST Law has been in force since 1st of July 2017, after the 18th GST council Meeting held on 30th June 2017. From the date of Implementation of GST law, GST council held 5 more meetings on different dates (Latest 23rd Meeting was held on 10th November 2017) in which the council has reviewed various Provisions of the GST law due to various reasons. While there will be certain initial transition challenges, GST will bring in clarity in many areas of business. One of the areas is accounting and bookkeeping. 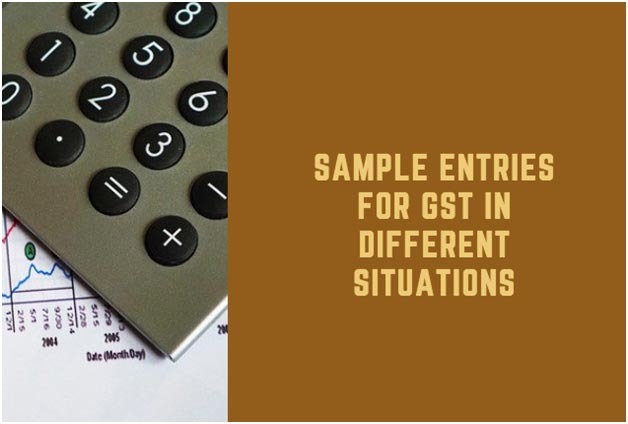 In this Article, we are going to discuss about the Change in accounting entries after Implementation of GST law to keep the books of accounts at par for Compliance with the Law. When GST was introduced there were many other taxes vanished by the Central Government/State Government, following the taxes which are not in force after GST like Excise, VAT, CST, Service Tax. For those taxes we required to maintain separate books of accounts, ledger, register etc (apart from the Purchase, Sale, Inventory) . GST is One Tax, which includes impact of all previous taxes such as Excise, VAT, and Service Tax. While, the number of accounts is more, apparently, once you go through the accounting you will find it is much easier for record keeping. One of the biggest advantages Mr. A will have is that he can set off his input tax on service with his output tax on sale also. Thus, after adjustment of input tax credit, tax liability of Rs. 27,000 is reduced to only Rs.5,940. It can be noticed from the above that GST paid on legal fees is also adjusted which was not possible before GST scenario. If, any input tax credit remains, the same can be carried forward to the next year. IGST input will first be applied to set off IGST and then CGST. Balance if any will be applied to set off SGST. So out of total input IGST of Rs. 27,000, firstly it has completely set off against IGST. Then balance Rs.9,000 against CGST. From the total Rs.45,000, only Rs. 14,040 is payable. GAAP is applicable on GST. Principle of Revenue Recognition etc. will automatically be applicable. It is mandatory to comply with the GAAP. Every registered person must keep and maintain books of account at least for five years from the due date of filing of Annual Return for the relevant year. Due to Transition to GST it is needed to address aspects of financial reporting systems for proper reporting & compliance under the law. It has been noticed by us that many of the business facing accounting or compliance issues due to various reason one of them being accounting issues, which has been addressed in this Article.For other identified issues, we are here to assist you in the interest of both Assessee and the Government of India and Indian states. If you seek any further clarity , feel free to write to us on, info@gapeseedconsulting.com or you can also call us at +91-9599444639.